“Thomas Medvetz has written a terrific study of think tanks—complicated but truly important institutions. He is especially good at showing how think tanks act as a link between the political and intellectual dimensions of American life. Every academic social scientist should read this book, because it explains how think tanks have helped relegate them to the margins of public debate. “Over the past half century, few developments in the U.S. political system have influenced the content of real legislation more than the rise of think tanks. But until now, information and analysis of this phenomenon has been mostly anecdotal and known only within the Washington Beltway. Thomas Medvetz provides a much needed and thoughtful analysis of the history and relevance of these important institutions; Think Tanks in America is an invaluable resource. “Succinct, thorough, and masterfully researched, Thomas Medvetz has written a subtle and timely history of these fixtures of public debate in the United States. 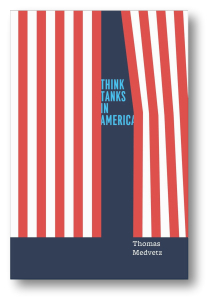 In the realms of culture studies, policy, and policy formation, there is no book quite like Think Tanks in America. Plus which, no one has understood, interpreted, then used Pierre Bourdieu's ideas better—so well that Bourdieu himself would have been pleased."